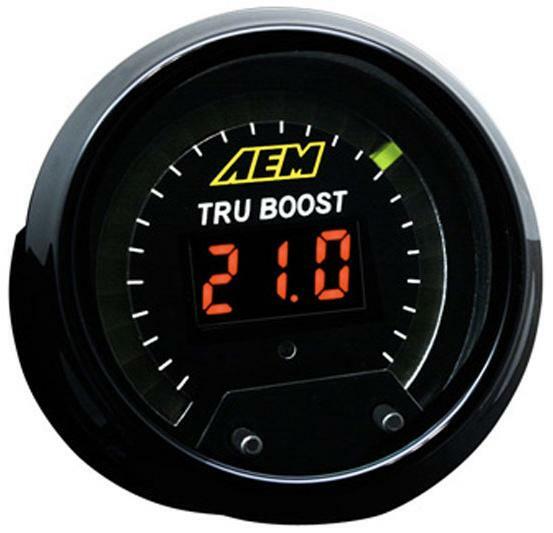 AEM’s TRU-BOOST Gauge-Type Controller is an electronic boost controller that combines the simplicity of a manual boost controller with the added ease of adjusting boost levels through a gauge interface. There is no external interface required for set up, and it is fully functional right out of the box. There are no gimmicks or special software programs included. If you want more boost press the button on the right of the gauge face, and if you want less boost press the button on the left of the gauge face. It’s that simple, and IT WORKS! AEM’s TRU-BOOST Gauge-Type Controller includes everything you need, including an on-board 29 psig pressure sensor, built-in Overboost protection with two timed shutdown levels, a scramble boost setting and a low-side output for a warning light. AEM offers a 75 psi boost sensor for high boost applications (sold separately). AEM’s boost control solenoid (included) is the only one specifically manufactured for automotive boost applications, which means it won’t corrode and stick from exposure to rich fuel mixtures, it is pressure tested to 100 psi and includes -4 AN fittings to eliminate any chance of leaks. No external interface required for programming!